Walk-in Drive for Vee Technologies Private Limited AR Caller Trainee- Apply NowVee Technologies Private Limited career As expected 2018 also is going to conduct recruitment drive for Freshers and experienced. Latest Career Vacancies has been announced by at this company. So this will be a good news for all job seekers, the candidates who are waiting for Vee Technologies Private Limited Recruitment 2018. Candidates with various qualifications like Any graduate can find Walk-in Chennai in TamilNadu. Both fresher and experienced candidates can also check here for upcoming 2018 walk-in interview job details.if you want any details about this company check it given below. 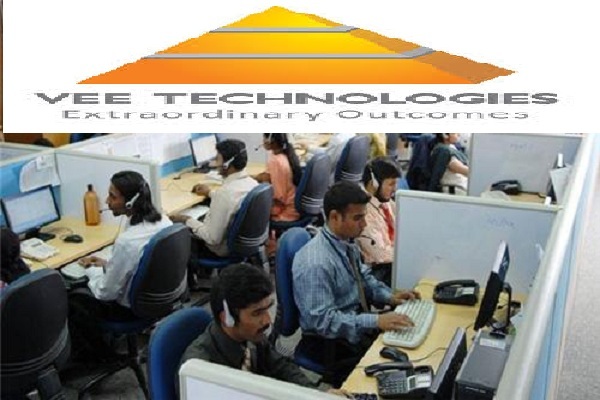 Walk-in Drive for Vee Technologies Private Limited AR Caller Trainee- Apply Now. Income: 1,50,000 - 1,75,000 P.A. Job opportunity for freshers , Vee Technology is hiring aspirant candidates for our business process. Good english communication with call center experience are also eligible. Any Graduates ( Diploma, BE, B.Tech, PG Graduates can also apply). Candidates having arrears or below 60% with good communication can also apply.